A great companion project to our W2747 Lion Sentry. Make it from standard "1x12" and "2x12" stock. All patterns drawn FULL SIZE on three huge pattern sheets. 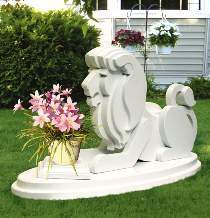 Lion measures 22"H x 7-1/2"W x 33"L. Base measures 48"L x 18"W. Make this lion with or without the oval base.